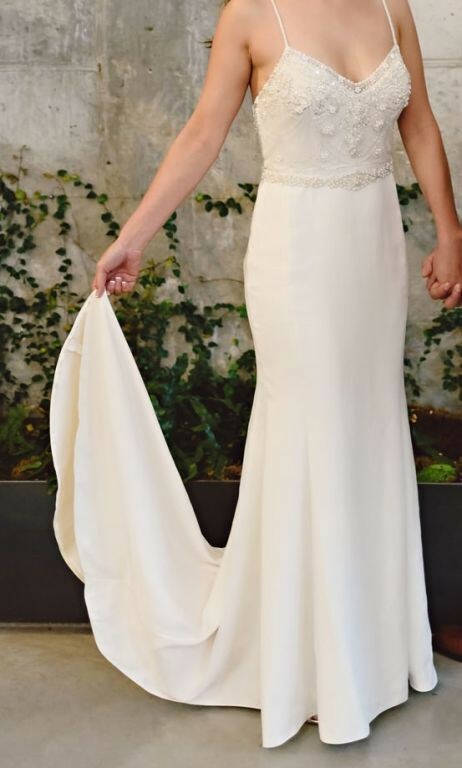 This dress is stunning, with beautiful beading on the bodice, with crepe sheath style dress that is light and airy to wear. With spaghetti straps and a short train, it's perfect for a summer or beach wedding. Although the sheath dress is in ivory, the bodice is in an "almond" that instantly warm the entire look from head to toe. Fits a 5'6" with 4" heels. Can be hemmed if needed. Condition: truly excellent condition. No tears, rips, or stains. Has been professionally dry cleaned. Was bought here but went with another dress, so has never been worn by me! Once you send a message, Veronica can invite you to purchase the dress.